’71 Came out on DVD in Australia last Thursday. 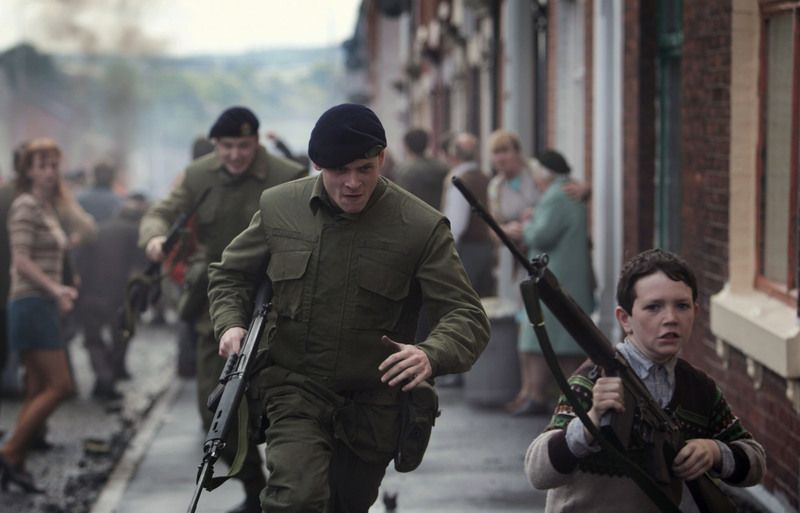 There is an uncomfortable appeal smouldering beneath films about conflict set in suburbia within the “United Kingdom.” It comes to the fore in ’71, the film about a young British soldier whose naiveté is swept away one remarkable night when the very physical conflict of a pitched battle in the heart of The Troubles, that started in the late 1960’s, strips him of all hope of a higher moral authority and brings him face to face with the real prospect of becoming his own saviour. 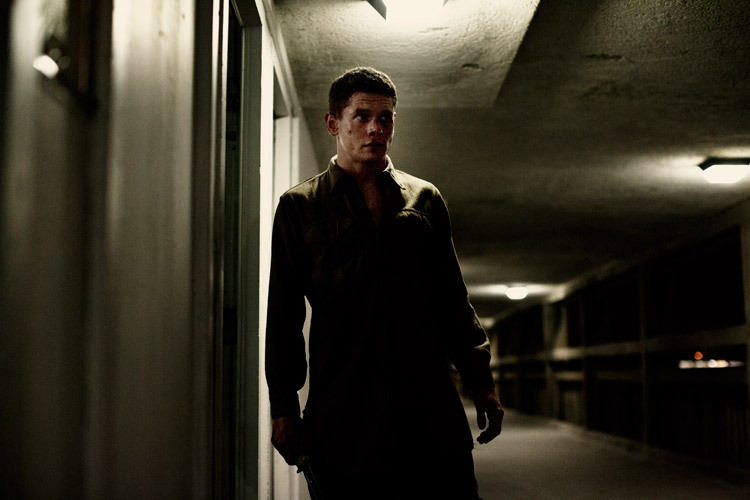 A young man, with no family other than a much younger brother who lives in an orphanage we imagine was the same one Gary Hook (Jack O’Connell) grew up in, decides to join the army, presumably because the State is his family and he doesn’t know what else to do. 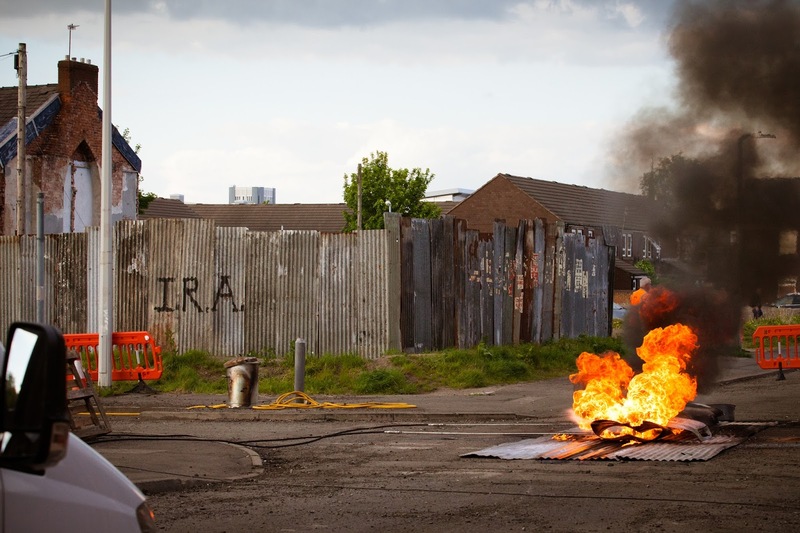 We watch him endure his training, only to be posted in Belfast, the telling words “you will not be leaving this country” plastering a look of relief and slight disappointment across his face. It is when he becomes separated from his unit after a terrible street riot that Gary will realise how unfamiliar this new territory of suburban warfare really is. As we watch Gary endure his ‘dark night of the soul’ the Catholics call it, or you could see it as his Joycean Ulysses, we see the facade of life’s safeties gradually being stripped from his innocent stare, which in the end, are the point and purpose of the suburbs – to protect us from the horrible facts of life’s pointlessness. The death of Gary’s innocence is reflected in the children around him all who belong to the war in some way, from the innocent love between brothers in the younger Darren, through to the shockingly street wise negotiations managed by the young Protestant loyalist to walks inevitably closer to his doom. A moment when Gary slides into an apartment to avoid a killer on his trail, and pulls out a knife deciding, for the first time to take action to defend his own life, is witnessed by a very young girl with stunning red hair who equally seems to mature decades in the fleeting moment she witnesses Gary take his own life in his hands. This combination of the safe place we call home and the war zone feels uncomfortably familiar, as if we are always expecting the smouldering unease of the suburbs to erupt into violence. 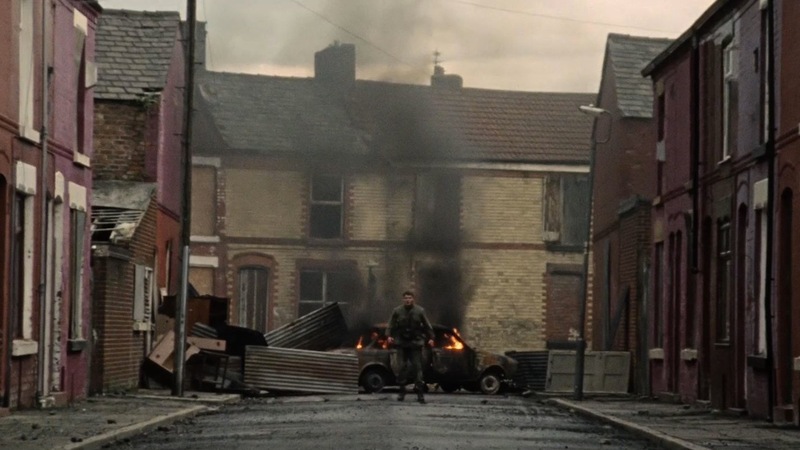 Freud’s fear of the neighbour surfaces when the enemy is not immediately recognisable or can change allegiance in a moment and so director Yann Demange’s reflexive inquiry into the self feels both true and inevitable. As it becomes harder for Gary to recognise friend from foe, he correspondingly trusts himself above all higher authority, and his anger at the end is properly realised in a renewed devotion to raise his young brother himself. This gives ’71 a gret deal of observational power and separates it from just another war movie, biopic or morality tale. 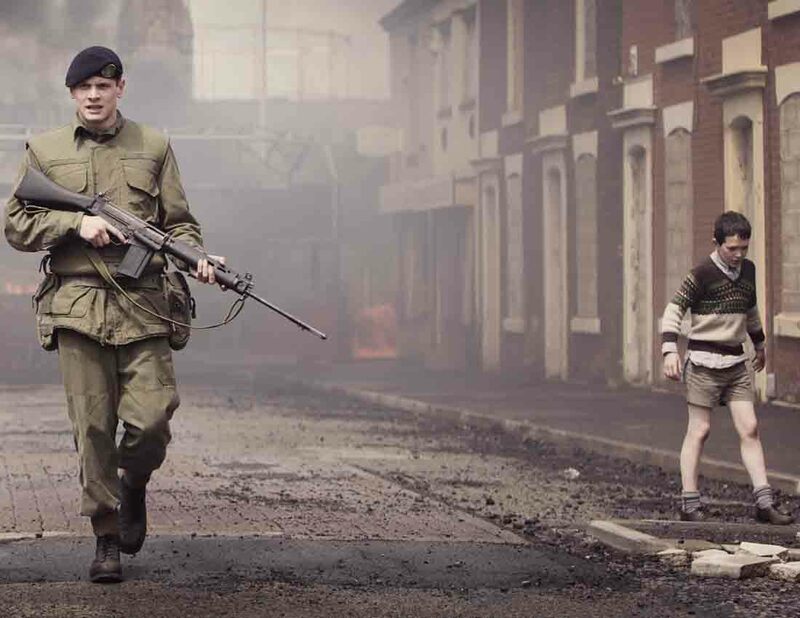 Demange has successfully tapped into what it is about The Troubles that so resonates – the Anglo version of a war brought right to the doorstep of one’s home. He achieves this through the constant gaze of the child, always affected and yet always engaged with their environment because it’s one to which they have swiftly become acclimatised. He also achieves it by the blurring of the suburbs of Belfast with the familiar site of the war zone, scenery that shocks us but seems familiar, until takes the action into an enormous apartment block, slows it all down and meticulously engages us with the truth of war and family life becoming co-mingled. Again, there is something familiar about all of this, as if we’ve always suspected a war was going on just outside our front door, or as is true for so many people, war that leeches its way inside the home. As we follow Gary our own faux innocence is stripped away and we understand his passivity more, as the desire to engage with self-defence appears to be the inevitable first step towards one’s doom, both physically and metaphorically. Any action causes a reaction and in a war such as The Troubles (and all domestic or suburban violence) side taking seals your fate while inactivity keeps your options open. Eventually we come to understand Gary’s unwillingness to defend himself more than we understand his desire to take action. It is this emphasis that makes ’71 so horribly true to life and shines a demystifying light on the truth of so-called passive victim. Tat Radcliffe’s cinematography too, is always dark and brooding, but unlike so many of these kinds of films that love to use the dark as a metaphor for misunderstanding, we are never left so completely in the dark that we can’t tell what is going on. This is a relief, because the script is complex enough as it is, and if there is a tip I can give those who intend on hiring ’71 to watch (which I highly recommend you do) keep track of faces and jobs if you can, because the film’s interest expands proportionately to your ability to keep up with the changing identities and alliances. Having said that, all the aforementioned eerie pleasures in ’71 are available for observation, and regardless of your level of understanding, there is a great deal to sink your teeth into in this compelling and beautifully made suspense/drama film.